Hurricane Hole Marina, Key West - 305-731-4987 Permit Redfish 'Cuda Cast off with Captain Johnny Irwin! Sea Chaser Hi, I'm Capt. Johnny Irwin and I've been fishing the waters in and around the Florida Keys for over the last 50 years. We have a great variety of fish from the shallow waters of the flats to the inshore reefs and wrecks and everything in between. With my 2004 22ft Sea Chaser boat and 4-stroke Honda 150hp outboard, you will have a safe, fast and quiet ride to pursue your trophy. You can fish many ways from live bait, plug casting and fly fishing and enjoy doing them all. At the end of the trip, the restaurant at the marina can prepare your catch to your taste. Looking forward to fishing with you and hope to hear from you soon. Catch you on the next tide, Capt. Johnny Irwin Hurricane Hole Marina, Key West - 305-731-4987 Permit Redfish 'Cuda ABOUT THE TRIPS Whether you are new to fishing or a skilled angler, Seabreeze FIshing Charters will customize your trip to make your day the best fishing day you have ever had! 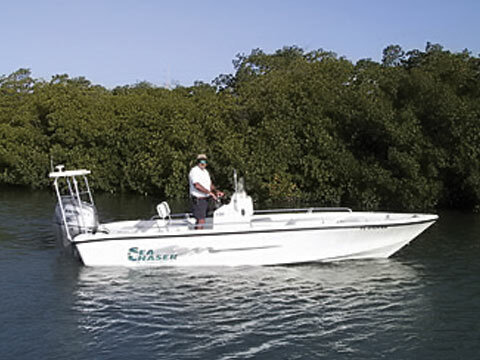 We offer private backcountry and light tackle fishing charters in some of the best waters in the Florida Keys. Fish for tarpon, permit, snapper, grouper, yellowtail, barracuda and more! Captain Johnny is an experienced third generation fisherman who knows all the secret fishing spots and how to catch the big ones. Boat Information * 2004 Sea Chaser Center Console with Poling Platform * 2004 Honda 150hp 4-stroke engine * twin live wells * dry storage * large casting deck * Furuno GPS/Fish finder * ICOM 45 VHF Items to Bring: * Drinks, plenty of liquids (water, soda, etc) * Lunch or snack. * Sunscreen, sunglasses and a hat. * Last but not least, Don't forget the CAMERA! Additional Information: * All trips are private charter. Sorry, we do not offer split or shared trips. * Our boat can hold up to four guests, maximum * Alcohol is allowed on your charter, please limit it to beer or wine. No hard liquor please. * All trips include bait, tackle, rods, licenses and a cooler with ice. * You are more than welcome to bring your own gear, but it is not necessary.